Vern Griffiths* quickly established himself as a respected performer, educator and collaborator after joining the Vancouver Symphony as Principal Percussionist in 1997. He also currently plays with the CBC Radio Orchestra and two new music chamber groups: Standing Wave and the Turning Point Ensemble. Vern can be heard on recordings with all of these groups, as well as on soundtracks for Disney, ABC, IMAX, NFB, EA Sports, and Dreamworks. Other recent performances include Festival Vancouver, Music on Main, FUSE, the John Cage Festival, Music in the Morning, and substituting as timpanist with the Victoria Symphony. Born and raised in North Vancouver, Vern has degrees in both Commerce and Music from the University of British Columbia, studying percussion with John Rudolph who was the VSO’s Principal Percussionist at the time. Vern then moved to New York and earned his Master of Music degree in Orchestral Performance from the Manhattan School of Music, as a scholarship student of Chris Lamb of the New York Philharmonic and Duncan Patton of the Metropolitan Opera Orchestra. Other studies include the Aspen Music Festival, National Youth Orchestra of Canada, the National Orchestral Institute (Maryland), the Altenberg Music Festival (Germany), and the Leigh Stevens Marimba Seminar. A committed educator, Vern has been teaching at UBC since 1997, becoming head of the percussion department and director of the Percussion Ensemble in 2005. Students of his have gone on to study with Alan Abel, Russell Hartenberger, John Rudolph, Don Liuzzi, Jack Van Geem, and Nancy Zeltsman; and have participated in the Aspen Music Festival, National Orchestral Institute, and National Youth Orchestra of Canada. 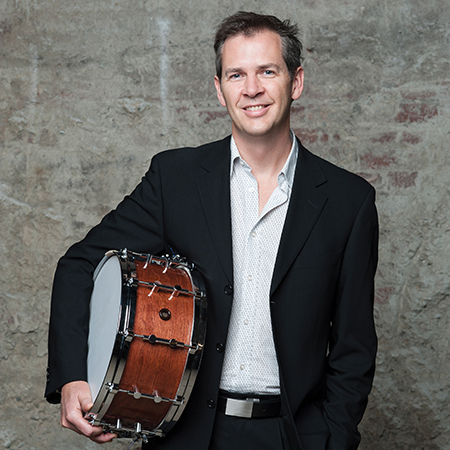 One former student is now the Principal Percussionist of the Chicago Symphony.